My whole family just returned from celebrating Christmas and vacationing at the wonderful Caribbean islands of St. Kitts and Nevis. Besides the normal sun, sand, snorkling, and snoring that generally accompanies a beach vacation; this trip included plenty of local beer, rum, and hammond: local moonshine. When arriving in St. Kitts you immediately notice the supremacy of Carib beer advertising as its displayed everywhere - bars, billboards, and boats. Even though the parent company is located in Trinidad, there's a local Carib Brewery that produces its namesake beer as well as almost anything else drunk on the island - including Ting (grapefruit juice beverage) and Shandy (low alcohol, sweet beverages). Once you tire of the the sweet malty flavors of Carib, most bars also carry Skol and Stag - two European styled lagers with slightly more hops - but headaches galore. 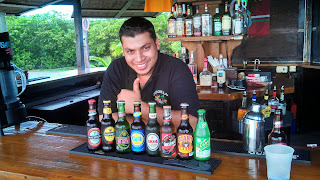 Most interesting, during a beach bar crawl on Frigate Bay, the friendly bartender Aleric at ChinChillas, brought out two surprise local beers: a Guinness and Mackesons. Apparently Carib Brewery partners with the parents of these brands (Carlsberg for Stol) and brews these favorites on the island. The Mackeson Cream Stout became a regular night time ritual and I learned to drink Guinness in the local custom - on the rocks. 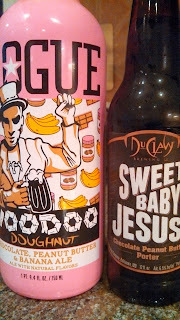 Best of all, there was price parity between the stouts and the lagers. >Beer's all good, but of course when in the islands, Rum is the word and I immediately headed to the Duty Free store to at the Marriott to stock up for the week. 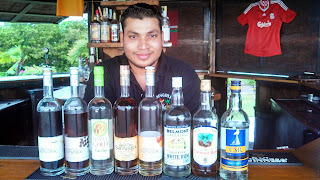 They offer samples of the various rums locally distilled at Brinley Gold Shipwreck Rum. The distillery offers a wide portfolio from spiced, coconut, mango, vanilla, and even coffee - which may have been my favorite. Their spiced rum was not over the top (mostly vanilla and nutmeg) and was a nice sipping rum for Christmas. However, I was seeking a solid reserved rum to fortify weakly made coladas and rum punches and none of Havana Club Havana Club Añejo 7 Años - my mind was set - not only because of its Cuban origins but also its a sweet honey and nutty flavor. I carried a water bottle filled with the HC all week, great for sipping on the beach or fortifying cocktails. One of these cocktails was a Ting and Sting - the grapefruit beverage above and Cane Spirit Rothschild (CSR) - a white rum produced from sugar cane syrup. Quite refreshing - although CSR comes with a burn - don't bother drinking neat. Although still billed as the Spirit of St Kitts, CSR has been distilled by Demerara Distillers Limited in Guyana and then bottled at a plant in Basseterre since the death of CRS's founder Baron Edmund Rothschild. Another rum distilled by DDL and bottled in St. Kitts is Belmont Estate, a medium bodied rum - nothing special - but at $8 a decent souvenir. Now being a fan of all things distilled - and those undercover of darkness - I asked around about real locally made rum and learned about hammond. 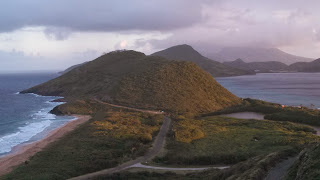 This is the St. Kitts version of moonshine and most is now made in the more secluded island of Nevis. Fortunately we planned a Blue Water Safaris catamaran excursion to the island where I learned that several bars utilize the hammond in their rum punches. At our first stop, I asked for several rum punches and a hammond and with a smile the bartender pulled out a container containing a clear liquid and poured a couple fingers. This one had a hot sugary aroma, but the flavor profile was rather smooth - trending more to a cachaca then traditional rum. The punch was also made with hammond and with the addition of a nutmeg sprinkle was a more interesting twist of the standard fruity flavor. I then pressed my luck and asked if there were any darker versions of hammond and after a few whistles and shouts a water bottle appeared with a medium roasted looking rum. The aroma was incomprehensible - part peat, part hay, part tobacco - with a more pronounced wild nutty flavor that lasts forever. The most bizarre spirit I have ever tasted - but so intriguing. This hammond was distilled from molassis that has been fermented with with yucca and aged with green nuts. Guiness on the rocks is a nice chaser to this one. 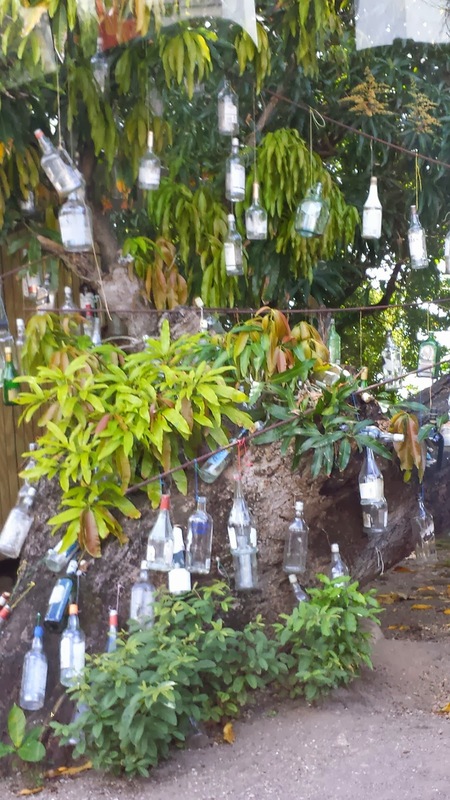 Finally, no trip to St. Kitts is complete without a stop at the famous Rum Tree - between Sprat Net and the entrance to Caribelle Batik. Now that's a Christmas Tree. Cheers and pair with any steel drum or reggae music. During the past few weeks I have been learning about Argentinean wine through Protocol Wine Studio's titter chat #winestudio. This week they had planned their Grand Tasting of the wines discussed in previous weeks, and wouldn't you know that that day, I received a prize from Argovino a reviewer of Argentinean wine. 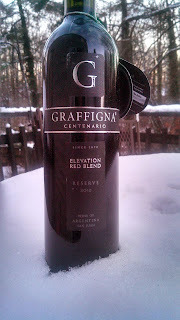 Apparently my email was selected from their newsletter subscribers and I was sent the Graffigna Centenario Elevation Red Blend Reserve 2012 ($10). Forget about the price tag for a moment. The Graffigna family immigrated from Italy and settled in San Juan, Argentina - establishing the winery in 1870. 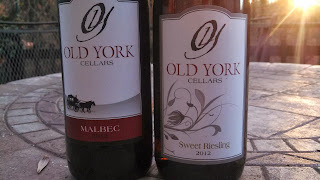 This makes them the oldest winery in the Pedernal Valley and the second oldest in all of Argentina. San Juan is located in the steppes of the Andes Mountains - a desert climate - dry, with 310 days of annual sunshine. 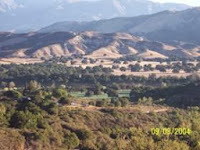 Wind sweeps off the mountains that help to prevent mildew rot and disease. The Graffigna estates are located anywhere from 700-1,500 meters above sea level on steep slopes that are nourished from an underground water supply. Graffigna Centenario Elevation Red Blend Reserve 2012 is an equal blend of Bonarda (Douce noir/Charbono), Cabernet Sauvignon, Malbec, Syrah, and Tannat. The wine is fruit forward, made to be drunk now, even though there are some subtle tannins to balance the fruit. The flavor is a jammy blackberry plum combo followed by nice acidity. This is a very drinkable wine and for ten bucks - what's not to like. Pair with The Gipsy Kings. Cheers. 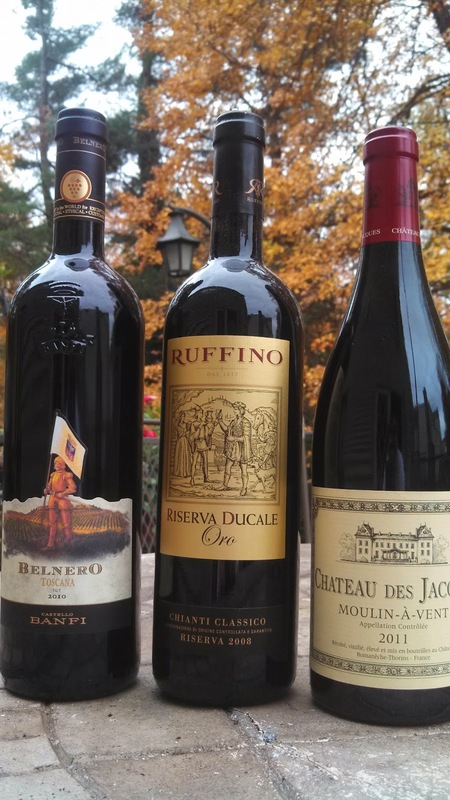 Our friends at the Wine Chateau sent us another care package this Fall and I immediately saw fit to open the 2011 Château des Jacques Moulin-à Vent ($23). The wine is part of the Louis Jardot portfolio and is made from Gamay grown in the prestigious Moulin-à-Vent appellation in Beaujolais. Nothing wrong with the seasonal Beaujolais Nouveau, but this is a more Burgundian wine - having spent ten months in oak (30% in new oak) - and is age-able for those with patience. Not here. This is a juicy wine, full of black cherry, plenty of texture, with a slight mocha chocolate finish. Well done, indeed. 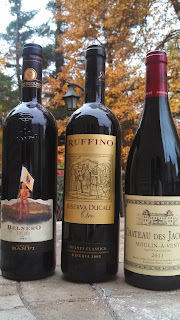 Check back soon when we open the Ruffino Classico Riserva and Castello Banfi Belnero. Cheers. 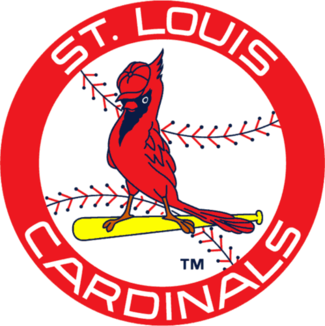 Besides being two great baseball cities, St. Louis and Boston are also great craft beer, wine, and craft spritis cities. Budweiser and Sam Adams are easily recognizable; but there are several new rising stars in these competitors. Starting with wine, St. Louis is the base camp for journeys into Missouri Wine Country - particularly west into the Hermann and Augusta AVAs and south along the Mississippi River. The Norton grape rules here and Missourians recognize its virtues along with Vignoles, Chardonnel, Chambourcin, and other hybrid grapes. There are fewer local wineries surrounding Boston, but you just got to find them - usually south through the Coastal Wine Trail. One surprising good find is Westport Rivers Vineyard & Winery. In Massachusetts the trail also includes Coastal Vineyards, Running Brook Vineyards, Travessia Winery, and Truro Vineyards of Cape Cod. 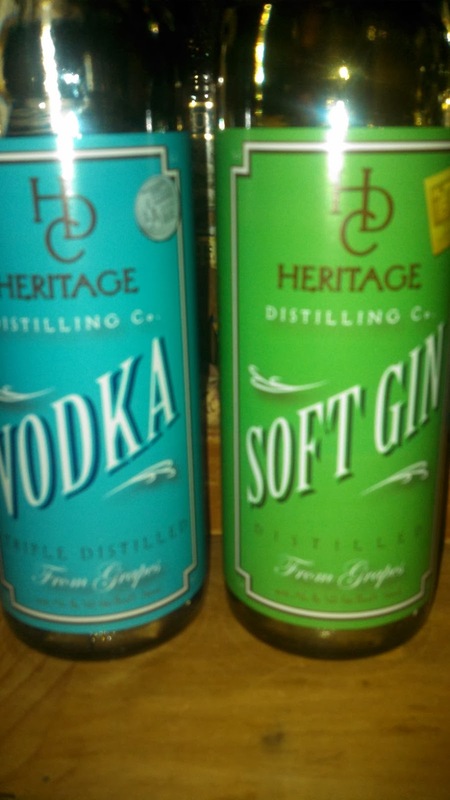 As for spirits, both cities are deeply involved in the craft distillers market. 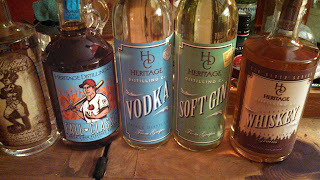 In Cardinal country, Square One Distillery, Still 630 and a little west, Pinckney Bend Distillery are producing various whiskeys, vodka, gin, and even rum for the local market. 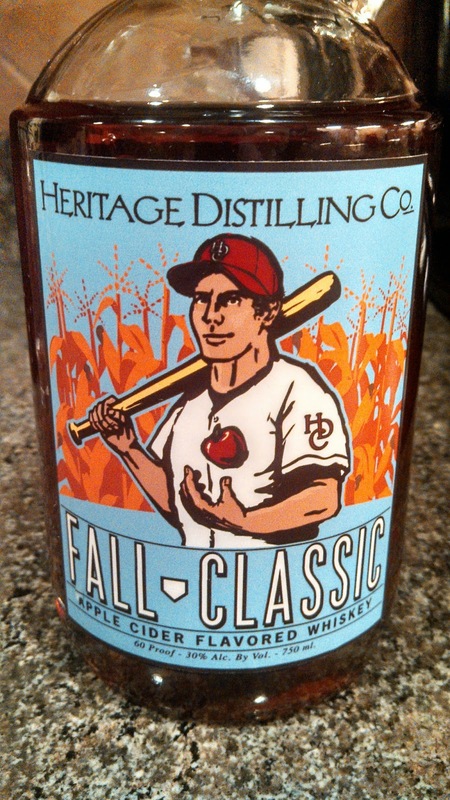 In Red Sox territory, Bully Boy Distillery and Nashoba Valley Distillery are distilling on Boston proper while Turkey Shore Distilleries and Ryan and Wood Distilleries are operating slightly north. Rum is a bigger player in New England, more reflective of the colonial experience; but there is also plenty of locally produced whiskey, vodka, gin, and brandy. Finally, St. Louis and Boston are quite obviously associated with beer. Obviously there's Anheuser-Busch; but Cardinal fans drink plenty of local craft beer with over a dozen operating in the region. My personal favorite is Schlafly Bottleworks and their canned line of Session beers. Boston and beer are practically synonymous and as the documentary How Beer Saved the World suggests, the Revolutionary War was argued over a few pints. And the contemporary east coast craft beer revival originated in Red Sox land with the Boston Beer Company, Harpoon Brewery, & Ipswich Ale Brewery. There's plenty more craft brewers who have followed in their footsteps Trillium Brewing, John Harvards Brew House, Cambridge Brewing Company, Somerville Brewing Company, and others. And as always information concerning these establishments are listed at WineCompass and theCompass mobile app. I know it's already late in the pumpkin beer season and am sure people have tired of pumpkin beer reviews; but I'll beat a dead horse and release mine. And mine tastes are definitely skewed towards less spices and more pumpkin. During the last month I've tasted about 15 different pumpkin beverages and found almost all tilted to the spicy-sweet side - sort of like biting into a store brought pumpkin pie with loads of nutmeg or clove. Instead I prefer a beer with either a balanced ratio between spices and pumpkin or one that leans completely towards pumpkin. 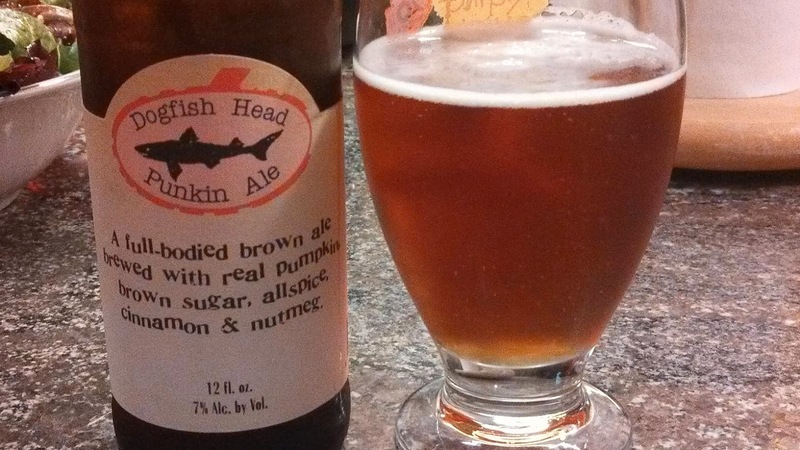 That being said, my habitual favorite is the King of pumpkin beers, the Dogfish Head Craft Brewery Punkin Ale. Probably the first I ever sampled and ever since I've counted on this beer to deliver a consistent and equal balance between spices and meat. And every year Dogfish Head delivers. Another beer I crave during the Fall is the Epic Brewing Company - DC Brau Brewing collaboration -- Fermentation Without Representation Imperial Pumpkin Porter. This is another balanced composition of coffee, chocolate, pumpkin, and spices blended to form a perfect morning brew. The newest surprise was the Uinta Brewing Punk'n, a beer that displays very little spicy character, but instead a strong and tasty pumpkin flavor. There is no doubt I could consume many of these in our sitting. 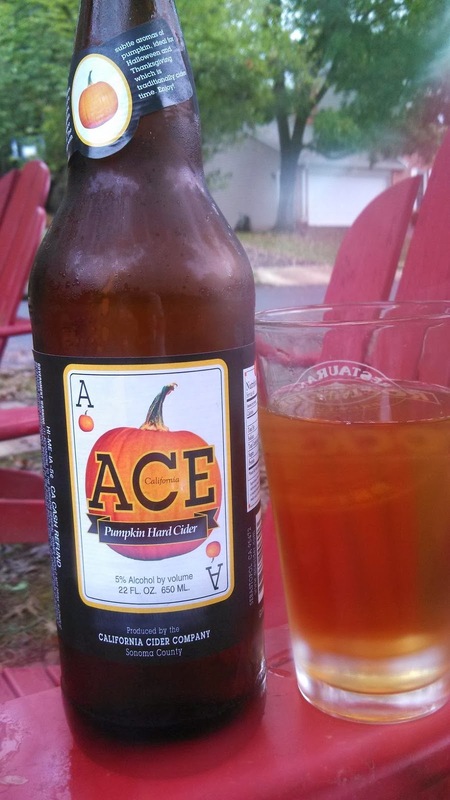 Finally, the one beverage that breaks my profile generalization is the Ace Cider Hard Pumpkin Cider. This is a sweeter cider with plenty of spices and it does taste exactly like apple pumpkin pie. Treat it like a slice of pie - I could only consume one pint at a time, but those with a sweater tooth - go for it. 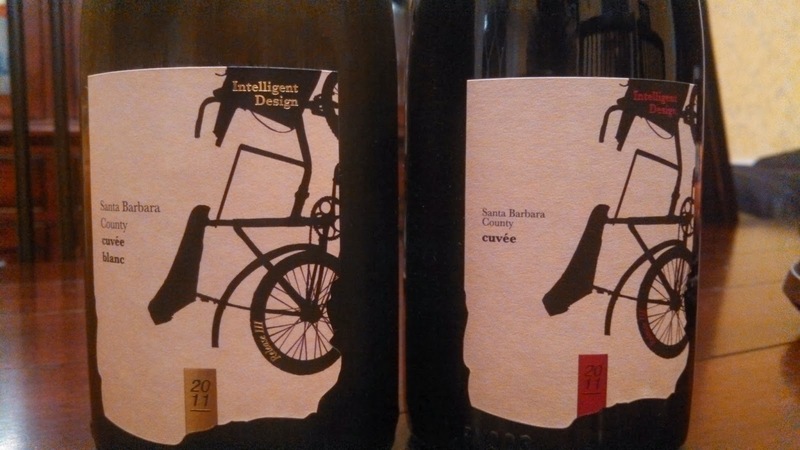 Last week I was fortunate to be invited to a blogger's tasting at arguably the best wine shop in the District of Columbia, MacArthur Beverages. Not only does the store have a tremendous wine and spirits inventory, its also a nice commute - traversing Key Bridge, Georgetown University, the Reservoir, and returning on Chain Bridge. The topic for this evening's tasting was Brut Grower Champagne - aka - estate driven champagne focusing on a particular estate or vineyard. And we tasted blind so that we weren't influenced by a particular Champagne house's reputation. This mode made that tasting quite interesting. 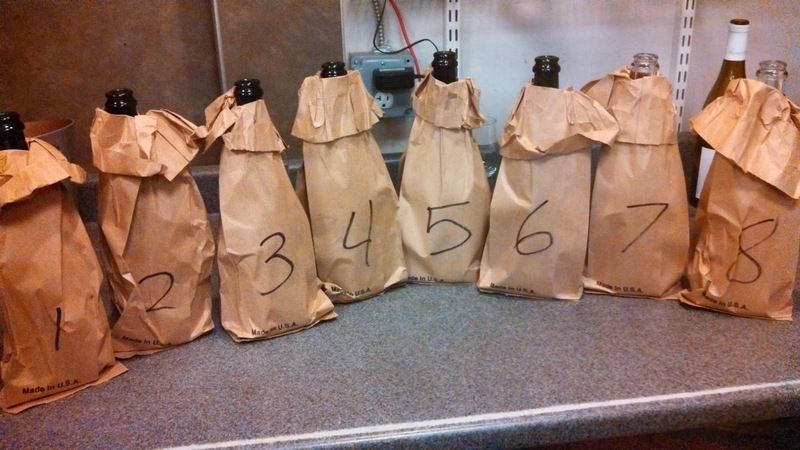 The first list are my tasting notes; followed by the revealing. 6. Punch in the face - intense. But, finish falls off. 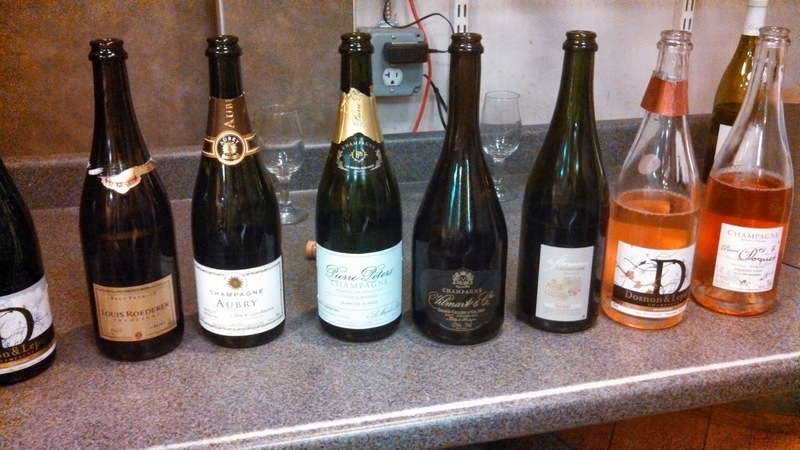 My favorite was #4 the Pierre Peters Brut Blanc de Blancs Grand Cru Cuvee de Reserve and I found #3 the L. Aubry Fils Brut Premier Cru very interesting - perhaps because of the 50% Pinot Meunier. Many of my associates preferred #5 the 2007 Vilmart & Cie Brut Grand Cellier D'Or but there was enough funkiness that threw me off. 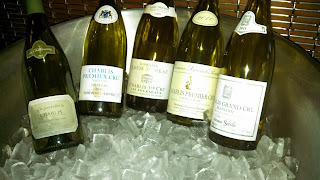 The rest were generally tasty and easy to drink, except for the Louis Roederer Brut Premier which had a strong vegetable - celery profile that forced an early dump. Thanks to Phil and the MacArthur staff for the hospitality and also for a nice tasting of Highland Park Scotch - the 15 year was smooth, lightly peaty, sherry-ish finish -> basically pretty awesome. This weekend I met my parents at their Silver Spring office and we decided to watch a few football games at a new brewpub that opened down the street: Fire Station 1 Brewing Company. The operation is the work of retired firefighter Jeremy Gruber, who incidentally started his career at Fire Station 1, then purchased the old firehouse when the department moved across Georgia Avenue. 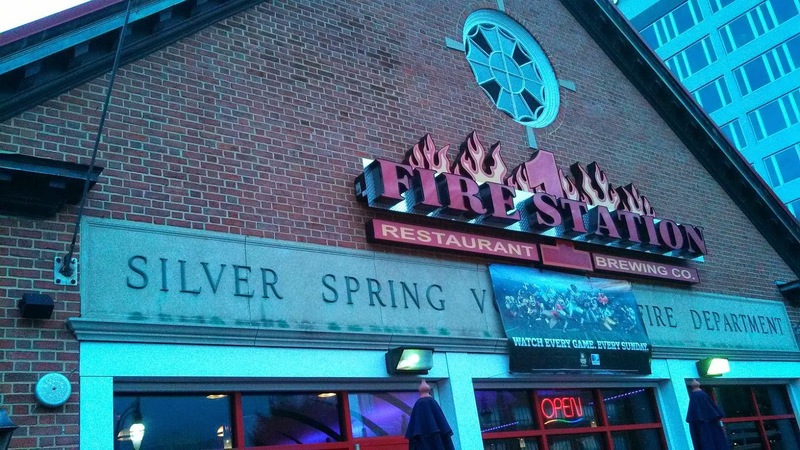 As you would expect, there are plenty of historical information about the Silver Spring fire department as well as fresh Maryland brewed beer. On this day there were two Fire Station 1 brews on tap, the Daily Crisis IPA and Something Red. Neither of these were flashy or extraordinary; the IPA was paler than most and contrarily the amber ale could have used a little more hops. (My Father had no problems with either - so maybe my beer geekiness is showing.) But supplemented with a few beers from Baltimore's Heavy Seas Brewing Company there was more than enough local beers for me - plus plenty of television sets to watch every football game - sort of like being in Vegas. The photo on the right show's their page on theCompass. Cheers to Gruber and Fire Station 1. Perfect timing, the day I received the November 15th Wine Spectator, which includes an article on Paso Robles Cabernet Sauvignon , I received a bottle of the 2007 Imagine Wine Pearl Paso Robles Cabernet Sauvignon ($39) as part of the Imagine Wine 2007 Winged Paradise Mountain Syrah Release Night. As further evidence of winemaker Ross Rankin's belief in long oak treatments, before bottling, this wine was aged 36 months in a combination of French, Hungarian, and American oak. The result is actually a much smoother wine than anticipated, full of dark fruit , velvety texture, and the light tannins indicate a very smooth finish. An extremely pleasant wine. Apple Pumpkin Pie in a bottle; that's the Ace Cider seasonal offering: Pumpkin Hard Cider. The cider is made moderately sweet with plenty of pumpkin, cinnamon, cloves, and allspice. Yet it is quite balanced between apple and pumpkin flavor and the apple's inherent acidity subdues the sweetness. Quite tasty, although even at only 5% alcohol, one glass was enough per sitting. Cheers. This past Friday night, October 13th, I was fortunate to participate in a special #winechat featuring Imagine Wine and their '07 Winged Paradise Mountain Syrah ($80). 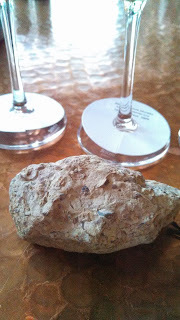 While proprietor Ross Rankin hosted a release party at the Santa Ynez tasting room, about a dozen bloggers from across the U.S. joined Twitter and\or Skype to taste and discuss the wine. During the evening we learned more about Rankin, and his wife Lyn Dee; the Paradise Mountain Vineyard and Syrah; as well as Rankin's transparency in describing his winemaking process. growth. Yet, Ross is able to ferment this Syrah for almost a month, whereas normal fermentation usually occurs within one to two weeks. Because of the high PH, the wine does not get bitter during this longer fermentation and instead, according to Rankin, "pulls flavor, color, and also macerates the grapes in such a way that it produces an unfiltered wine that is 'heavy' and particle laden". The fermented wine is then aged in a combination of oak treatments and remained in barrel until the recent bottling. This multi-year storage added $12,000 to the production costs and accounts for much of the $80 price tag. I opened the 07 Winged Paradise Mountain Syrah about 30 minutes prior the release party, an act I could have conducted even earlier. The Syrah definitely needed time to breathe, and over the course of the night exuded different characteristics in the nose and finish. It started out a fruit forward wine in the nose in the palette with a dark berry (blueberry & blackberry) characters and a hot finish (16% alcohol) with plenty of acid - even with the high PH - and plenty of spices. Over time, chocolate flavors emerged in the nose and palette and the alcohol and acids receded in the tail, although the spicy finish remained. Some of us agreed that the finish resembled a Paso Robles styled Zinfandel, and from a previous #winestudio chat, the finish seemed to me to resemble a Croatian Plavac Mali. 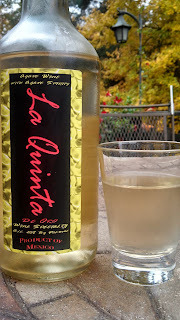 In total, this is a well made wine and in the words of MyVineSpot: "Good concentration of fruit, depth and length. Round around the edges and handles the 15.5% well." 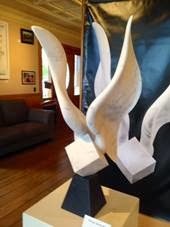 The label is also worth mentioning as it is based on the “Winged Series 2” sculpture created by Rankin's son Blake in his Santa Barbara Rankin Sculpture studio. Pretty cool; made from marble imported from Carrera Italy. Cheers to the wine making and sculpting Rankin family. Oh, and thanks for the 2007 Imagine Wine Paso Robles Cabernet Sauvignon (review coming later). I was pleasantly surprised with the Crispin - The Saint. The Trappist beer yeast masks the apples in the nose; with the apple flavor appearing in the mid palette. 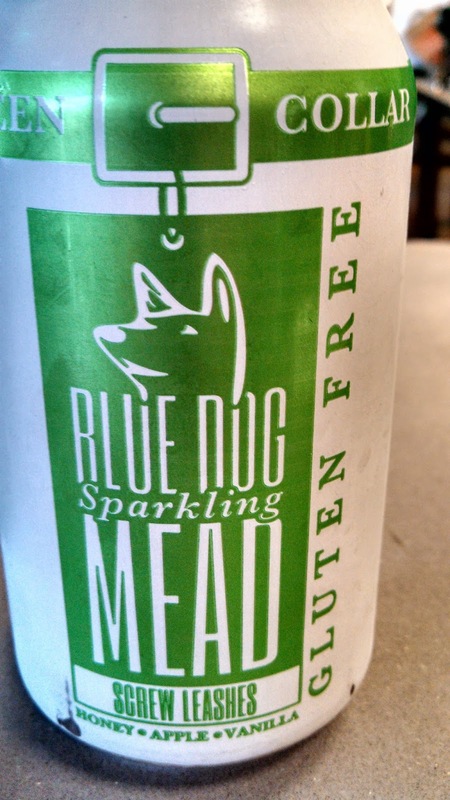 The maple syrup makes its presence known in the finish - balanced with rustic apple flavors. 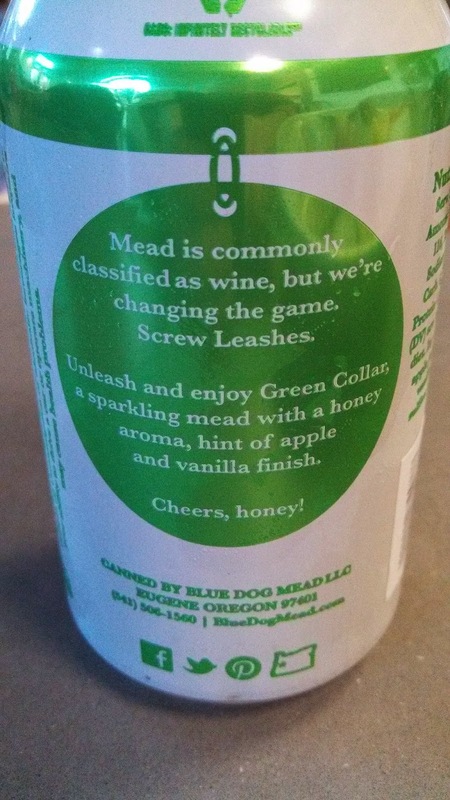 Would like a little more effervescence, but great value cider. 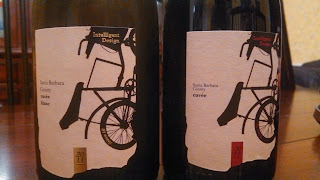 Recently I enjoyed this Yauquen Torrontés from Bodega Ruca Malen and didn't recognize the Salta region of Argentina. Mendoza yes, Salta no. 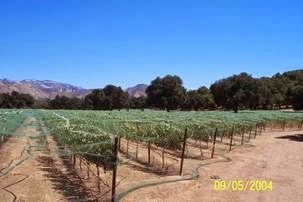 The area is located in the northwestern portion of the country bordering Chile, Bolivia and Paraguay and consists of three main viticulture areas: Cafayate, Santa María and Colomé. In the valleys, olives, maize, and tobacco dominate the landscape, yet vineyards appear once the elevation produces cooler nights to offset the brutal daily heat. 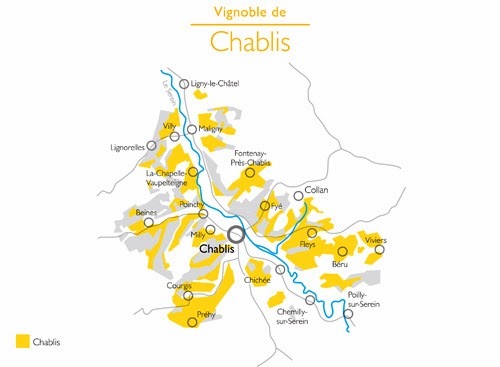 And eventually, these mountainous regions hosts some of the highest vineyards in the world, ranging from 5,000 to 6,500 feet above sea level - similar to some of the highest vineyards in Colorado. However, for the most extreme, head to Bodega Colomé and their Altura Máxima vineyard which resides at 10,027 feet above sea level. Oxygen mask anyone? As the picture suggests, Torrontés is the jewel of Salta - and represents its largest planted grape variety - although in total - this area produces less than 2% to total Argentinean wine production. Because of it's elevation, Torrontés from Salta are known for their inherent acidity as well as what a read, a "perfumed" aroma. The Yauquen displayed this acidity with less "perfume" and more citrus aroma and flavor. Great value at $12 particularly when acknowledging the transportation costs down the mountains. Looking forward to visiting one day. Cheers. 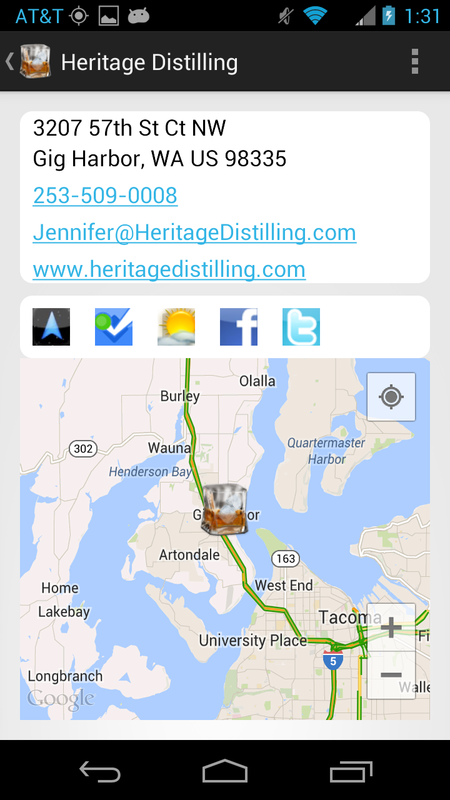 What are the Best Wine, Beer, & Distillery Mobile Applications? While designing theCompass Alcohol Locator, we downloaded several other similar Android mobile apps to research the strengths and deficiencies of the current market. 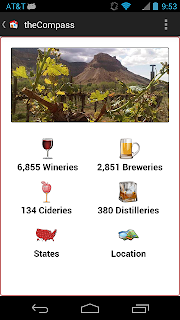 These mobile apps can be divided into two categories; (1) those that function as cellar inventories and tasting notes repositories and (2) those that are a compendium of wineries, breweries, or attempt to locate wine or beer in a specific area or establishment. Some applications attempt to provide functionality within both categories, but often fail to provide adequate service in both. For instance, I utilize Untapped, an application that does well in letting users review beers but suffers in locating craft beers in your area. This is a result of utilizing crowd sourcing, where their data is populated by users and not the establishments. The crowd sourcing option is easy to implement on the application side, but for the user the result is incomplete or outdated information. On the other hand, establishment applications, such as Lost Dog Cafe or World of Beer provide real time tapped information. Many of the best locator applications are specific to a region or establishment - such as the two listed above. Many states, regions, and enterprising companies have created applications designed for a specific geographic area that provide comprehensive information on their wineries or breweries. 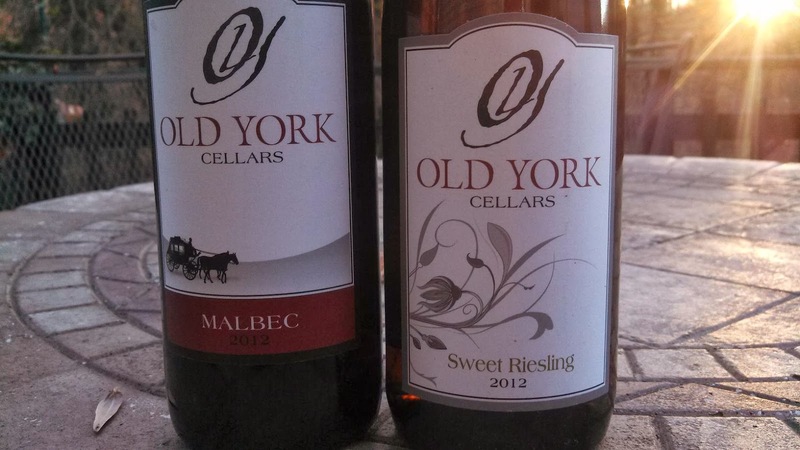 Two examples are Virginia Wine In My Pocket and Finger Lakes Wine Country. For me, the deficiencies in these applications are the result of their greatest strength -> they focus on one region, so if you plan on traveling to multiple regions, you must install multiple applications on your device. The one comprehensive wine application that we found was the America's Wine Trail app that provides excellent information by state, but not by geo-location. Thus if you are visiting Washington D.C., the application will provide information separately for Maryland and Virginia but not a combined view. Our video on traveling to Bristol Virginia\Tennessee for the Bristol Rhythm and Roots Reunion illustrates this concept.